Oh I just loved it! 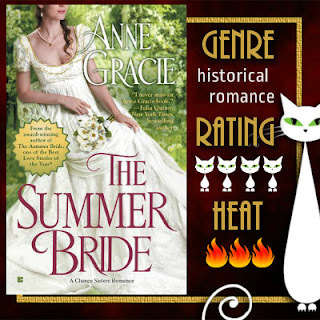 The Summer Bride was the perfect end to a stunning series from Gracie. The characters, the romance, the humor and passion all came together for an absolutely charming experience as the last Chance "sister" meets her match in a cocky Irishman who has a naughty gleam in his eye. "Playin' at? What do you mean? I've come to vis--"
"Stop jokin' around. You know what I mean. Sendin' me flowers--I know it's you so don't bother to deny it. And all those bloomin' morning visits--what are they about?" He hid a smile. She was spoiling for a fight. Not that he minded. "Something botherin' you, sweetheart? I thought you liked flowers." "Don't call me that! I'm not your sweetheart!" "Something botherin' you, my little hedgehog?" She tried to glare at him some more, but her lips gave her away and a laugh escaped her. She put her work down and gave a sigh. "Gawd, Flynn, you're enough to drive a girl to drink. What am I goin' to do with you?" He grinned. "I can think of a few things." And Daisy...the girl has a mouth on her! She's talented and makes gorgeous clothing but really has no time for anything else proper and girlie. She's slow to trust which could be a bit frustrating but knowing her past--she was a foundling and raised in a brothel until she escaped-- made it so understandable at the same time. She was passionate and determined in making her dream of owning a dress shop come true and I loved that about her. Feigning indifference she picked up her basket and rose as if to leave. "Thought you'd left already." He prowled towards her. "Forgot something." "What?" She looked around, but could see nothing left behind. "This." He took two long steps and hauled her into his arms. One brawny arm wrapped around her waist, lifting her right off her feet in a possessive manner that thrilled her to her toes. She tried to resist. "Oy, what--"
But his mouth possessed hers-- no hesitation, no careful seeking of approval, no attempt to seduce or entice--he just took from her what he wanted. And he wanted everything. He devoured, he plundered, he took greedily, hungrily, with an intense concentrated energy that simply shattered her. The romance was slow going but fun. You see them as friends and then the light bulb moment go off for Flynn and the hunt beginning. Once he's in he's...in. He wants it all. Marriage and babies and everything Daisy but Daisy is a stubborn one and not about to have none of that since it'll derail her plans to own her own dress making shop. The girl was crazy stubborn and it was pretty funny watching his courting her and her trying to avoid said courting. They had amazing chemistry both in and out of the bedroom. The two really were so perfectly suited personality-wise and so fun to watch battle, talk shop--even though such a crass thing! to talk money and business lol--and then realize their dreams together. For those that don't know the series. Daisy and her "sisters" aren't really related. They found each other on the streets and helped each other survive until an elderly lady took them in and decided to pretend they were long lost relatives of hers with the goal of turning them into ladies and setting them loose on the ton. It's been quite fun watching them all become a real family and find love in all it's different forms. All in all, The Summer Bride was a charming end to an amazing series. 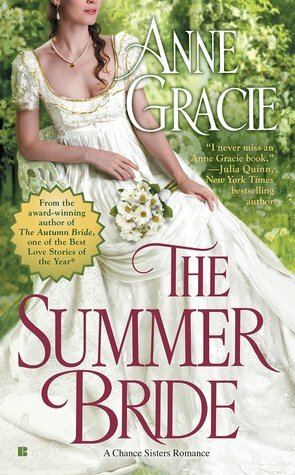 Gracie's writing is just lovely--unique, romantic and simply irresistible. 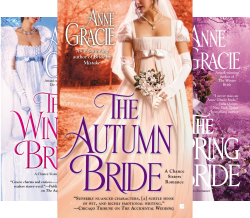 But Flynn wants a wife, not a mistress, and when Flynn sets his heart on something, nothing can stand in his way. . .